The other night, I had a bit of a harrowing experience. I woke up in the middle of the night to the smell of smoke in my apartment. When I got out to the living room, I could tell that I wasn’t dreaming and the whole place really was filled with acrid, chemically smoke. 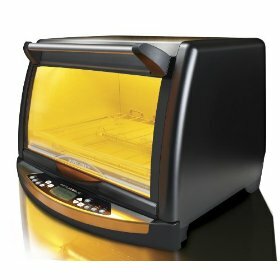 I quickly tracked it down to the new Black & Decker InfraWave Speed Cooking Countertop Oven I bought less than a month ago. It had somehow turned itself on in the middle of the night and was efficiently cooking the aluminum foil covered sheet pan that I’d left in there from several days before, as well as scorching the plate I’d left sitting on top of the oven. The front door to the oven was scorched black, and though I didn’t wait and observe if the infrared light was cycling on and off like it does in normal operation, I can only guess that it wasn’t. It was easy enough to unplug the unit, though it took a couple hours for my heart to stop racing and for the acrid smoke that had filled the living room and kitchen to dissipate. Even now, I still get the whiff of the burnt aluminum foil, especially when we come back into the apartment. When I first got the oven, a month or so ago, I was pretty impressed with it. It cooks with a combination of conventional heated coils and with intense white light. As a result, it doesn’t need to be pre-heated, and offers cooking times comparable to a microwave oven, but with the browning of a regular oven/broiler. I’d even given the oven a 4 star review on Amazon. But the other night, I have no idea what happened. I’m certain that the oven wasn’t accidentally turned on by someone brushing up against it or anything. (The way the control panel is configured, it requires you to press several buttons to actually turn the thing on.) It had been several days since I’d used the oven. I do recall that when I did last use it, I had been broiling a couple pieces of bacon, and since I still hadn’t used the oven enough to get the cook times down, I turned the oven off by simply opening the door. Even still, I had set the oven to cook for merely 10 minutes, and it had gone through most of that on the bacon. So what it was doing, all by itself, in the middle of the night the other night, I’m not sure. It looks like there was a recall on the ovens in the beginning of December due to the circuit board overheating and fire hazard. (It should also come as no surprise that according to that linked article, these ovens are made in China.) Also, according to their website, despite the name “Black & Decker” on the appliance, it’s actually a product of a company called Applica Consumer Products Incorporated. Black & Decker sold their household product line in June, 1998, along with the right to continue to use their name. So, lessons learned — unplug appliances that can burn down your house when you’re not using them; keep the smoke alarm installed, even if it does go off every freaking time you grill a steak; and don’t buy the Black and Decker Infrawave Speed Cooking Countertop Oven, at least not until they’ve worked the bugs out. Update: It looks like the recall I mentioned above was not for the model of oven I have. It was for the 2-slice bread toaster. At this time, B&D / Applica is offering no remedy for the problem I experienced. A nice side dish for steaks or roasted chicken. Clean the shallots by slicing each end, and peeling it down to the first clean layer without the papery skin. Place shallots in a small saucepan, cover with water, and add the sugar and the salt, and bring the water to a gentle boil, parboiling the shallots for about 10-15 minutes. Grease a gratin dish with a little butter or canola oil. Add the shallots, the cream, top with cheese, and seasoning. Bake for 10 minutes in a hot oven or toaster oven until hot and bubbly. Optionally, broil for a few more minutes to brown the top. Here’s a recipe my brother makes for cookouts. It’s pretty simple, but surprisingly flavorful and a nice change from hamburgers and hot dogs. These go better with a crustier roll than a regular hot dog bun, but those would do in a pinch. Pierce the wursts with several times with a fork and marinate the wurst in the beer and onions for a couple hours or overnight. Then grill them until done. You can also save the onions from the marinade and fry them up in a pan while you’re cooking the wursts and then serve them on top. This is a north african condiment, sometimes served chopped as a relish, or added to a braise or roast. A strong citrusy flavor that’s very different from fresh lemons. You’ll want 8 or 9 of the lemons to be large good sized and unblemished. The rest are just for their juice, so they can be smaller and cheaper. (If you want to economize, you can use fewer juice lemons and cutting the juice with filtered bottled water.) These will last 6 or 8 months in your fridge, maybe longer, considering the amount of acid and salt you are using. Make one jar for yourself, and give the other to a friend. Run the pickle jars and lids through the dishwasher. You’ll want them piping hot (sterilized) to work with them. Squeeze half of the lemons, straining out the seeds. Clean 8 or 9 of the lemons, scrubbing the skin and removing the label and the stem. Deeply score the lemons, end to end, without going all the way through to the center, several times. Work some salt into the cuts you’ve made. Squeeze the lemons into the jars, generously spreading salt between the layers. When full, pour the lemon juice in to the top. Lid, and put in the refrigerator. Let macerate for 3 or 4 weeks, turning the bottle and redistributing the salt, every couple of days. Inspect for any signs of mold or creepy crawlers. This recipe is really enhanced by the garlic. The more, the better if you ask me. And I don’t personally care for the quality of the meat from the ham hocks, but if you want to economize or be frugal, use it instead of the additional country ham. You can substitute smoked turkey wings for the ham hocks if you’d rather. Inspect and rinse the beans. In a largish pan with a tight fitting lid, add the beans, the rosemary (tied to minimize the number of needles that work loose), the ham hocks and the water. Bring to a boil and then simmer for 2-3 hours, covered. The beans should be soft but still whole. Once that’s done, drain the beans, remove the rosemary and if you’re economizing and not using the country ham, let the ham hocks cool until you can handle them to pick out the bits of edible meat, otherwise, discard. Using the same pan, thoroughly clean and dice the leeks, and sweat in olive oil for a few minutes. (If you’re using the country ham, add it to the pan and cook for a few minutes. Don’t add any additional salt.) Add the crushed garlic and a teaspoon of salt. Meanwhile, blend the beans in a food processor, probably in multiple batches, until smooth. (You can optionally blend one of the batches a little less to add some chunks and a little bite. Also, if you like rosemary, you can add a little of the rosemary from the earlier step.) Add to the pan along with the chicken broth stirring until smooth and heated. Haven’t had a chance to try this recipe. It’s in a cookbook that I’m giving away, so I thought I’d save it here. According to the book, “This dough rolls easily and will take a lot of handling and still make a flaky crust.” I’ve never seen a recipe for pie dough that calls for an egg or vinegar. Mix flour, salt, and lard together in a bowl, cutting in the lard with a pastry blender until you produce a crumbly texture like that of uncooked oatmeal. In another bowl, mix vinegar, water (or milk) and egg with a rotary beater. Then blend into the flour-lard mixture a little at a time. Blend well. Divide the dough into 4 equal pieces, enough for two double-crusted 9-inch pies. Refrigerate or freeze until needed. Here’s another — it doesn’t use lard. And you can make it savory by omitting the sugar, and adding thyme. (Actually, there’s so little sugar, that I usually toss it in even for a savory crust.) I’ve also added grated lemon peel — it makes a great addition to a blackberry pie. Put the flour, the sugar and the salt in your food processor bowl, and pulse a couple times. Add the butter and the crisco, and pulse 10 times. Add the water and pulse 10 times more. The dough should be crumbly but will stick together if you squeeze a small handful. Rolled out, it makes more than enough for a large pie.